Home air guitar france leggings marquis no war peace Splash Splash Color Splash it on tights Air guitarist splashes it on! Air guitarist splashes it on! Every once in a while, we come across someone who embodies exactly what We Love Colors is about -- having colorful fun, expressing yourself and spreading positive energy. Competitive Air Guitarist Rob is exactly this. 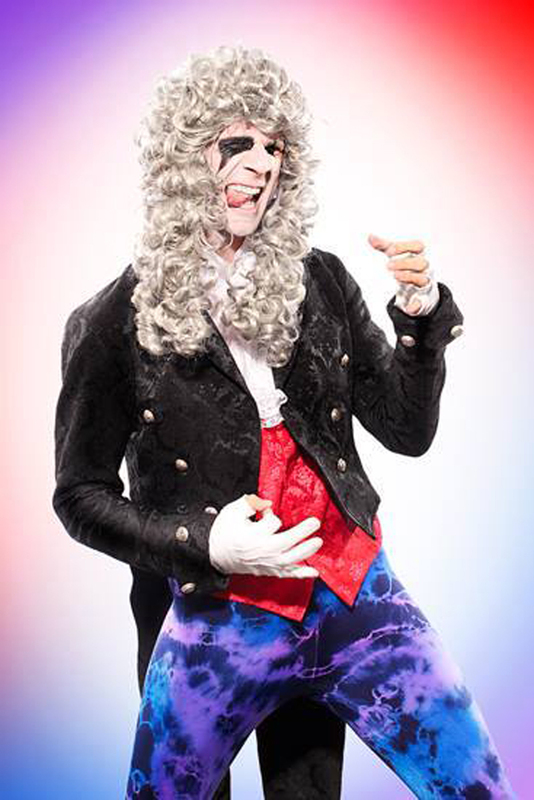 He let us into the world of competitive air guitar, which started in 1993 and is celebrated in 20 different countries in the spirit of world peace. You can read more about it here! The picture he sent is of his character, The Marquis; A time traveling aristocrat from 18th century France. Our splash men's performance tights truly make him stand out -- not that he needs it! “If you are holding an air guitar, you can’t hold a gun”. Colorful in more ways than one! Also, I think I have those tights. I'll think of Rockin' Rob every time I wear them.